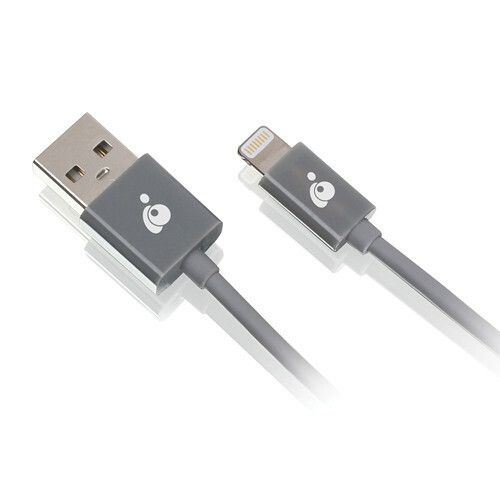 The 3.3' IOGEAR Charge & Sync USB to Lightning Cable allows you to sync any Apple Lightning iPhone, iPad or iPod with a computer or charge it from an AC wall adapter (sold separately). The cable features a USB male connector on one end and a Lightning male connector on the other end. Box Dimensions (LxWxH) 3.5 x 2.7 x 1.0"
3.3' Charge & Sync USB to Lightning Cable is rated 3.9 out of 5 by 9. Rated 1 out of 5 by Hiker guy from Died after one week The cable looked and felt sturdy, and after using it at home for a week (just charging phone overnight), the cable stopped working. It wasn't stretched or bent in the wrong place or misused in anyway. It just stopped working. It is cheap but I guess you get what you pay for. Rated 3 out of 5 by Sh from pretty good The cable is great- great priced. One issue i have is that it does not fit in with my case on it. So i have to take my phone case off to charge it. Rated 1 out of 5 by Jon from Defective I used it a couple of times before it stopped working. There is some kind of internal short, my iPhone beeps about once a second indicating charging and then the connection is lost only to reconnect again and again. I tossed the original box, so I guess I'm out $7. Rated 5 out of 5 by Gregor from The truth about iPhone cables With all the hoopla on the boxes it's hard to decide on a replacement cable for the iPhone. They helped me decipher the excessive verbiage and cut to the chase. I didn't need bling. I simply needed an affordable cable. Thank you B&H. Rated 5 out of 5 by Ron from Penn from Sturdy and high quality This cable is high quality and sturdy. In fact, it looks stronger than Apple's original cable that came with my iPhone. Rated 5 out of 5 by ewessmanphoto from It Ain't Rocket Science It's a cable that works. What else can I say?